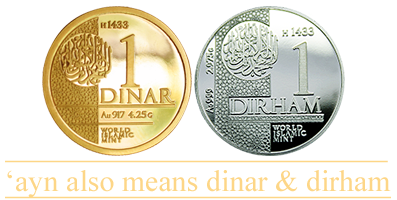 Dirham refers to the silver coins at the time of the Prophet ﷺ. In the beginning the Muslims used gold and silver by weight and the dinar and dirhams that they used were made by the Persians. The first dated coins that can be assigned to the Muslims are copies of silver dirhams of the Sassanian Yezdigird III, struck during the Khalifate of Uthman, radiy'Allahu anhu. These coins differ from the original ones in that an Arabic inscription is found in the obverse margins, normally reading "in the Name of Allah". Since then the writing in Arabic of the Name of Allah and parts of Qur'an on the coins became a custom in all minting made by Muslims. Under what was known as the coin standard of the Khalif Umar Ibn al-Khattab, the weight of 10 dirhams was equivalent to 7 dinars (mithqals). In the year 75 (695 CE) the Khalifah Abdalmalik ordered Al-Hajjaj to mint the first dirhams, thus he established officially the standard of Umar Ibn al-Khattab. In the next year he ordered the dirhams to be minted in all the regions of the Dar al-Islam. He ordered that the coins be stamped with the sentence: "Allah is Unique, Allah is Eternal". He ordered the removal of human figures and animals from the coins and that they be replaced with letters. This command was then carried on throughout all the history of Islam. The dinar and the dirham were both round, and the writing was stamped in concentric circles. Typically on one side it was written the "tahlil" and the "tahmid", that is, "la ilaha ill'Allah" and "alhamdulillah"; and on the other side was written the name of the Amir and the date. Later on it became common to introduce the blessings on the Prophet salla'llahu alayhi wa sallam, and sometimes, ayats of the Qur'an. Gold and silver coins remained official currency until the fall of the Khalifate. Since then, dozens of different paper currencies were made in each of the new postcolonial national states created from the dismemberment of Dar al-Islam. The question concerning entrusting property is legislated by the text of Qur'an. Entrusting wealth to non-Muslims is not allowed, but furthermore, taking a non-Muslim as a partner outside Dar al-Islam (where we stand over them) is extremely restricted, because they might cheat or might use our wealth in forbidden transactions. Since paper-money is a promise of payment, can it be permitted to trust the issuers while they hold the payment (our property) outside our jurisdiction? History has also demonstrated repeatedly that paper money has been a permanent instrument of default and cheating the Muslims. In addition, Islamic Law does not permit the use of a promise of payment as a medium of exchange. The Islamic Dirham is a specific weight of pure silver equivalent to 2.975 grams.